So after making a bunch of Wiksten Tanks (pics later), I bought some cool fabric thinking I’d make matching tank tops for my twin Jessica and me. My thought process behind choosing this fabric: we are pisces and her wardrobe is full of black, white, grey, and stripes. So I thought this might add a bit of colour. Um, a lot of colour. UMMM what was I thinking??? 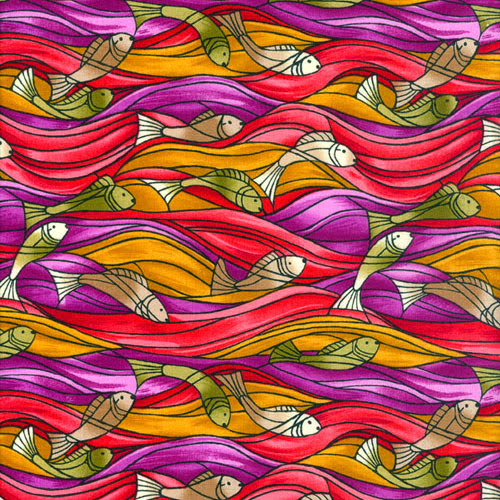 Lucky for Jessica, I didn’t have enough of the fish fabric to make two tank tops. So I decided to make myself a dress instead. With an elastic waistband (because the dress looks like a mumu on me otherwise) and pockets (because I hate carrying a purse. In fact, I don’t really own one). added an elastic (made it up): cut out a bias casing from fabric, 3″ wide, as long as the dress. Sewed it along waistline. LOL the fish are upside down. the fish are upside down!!!! What was I thinking? the bunching of the fabric because of the elastic waist looks a bit awkward but I don’t really care that much. Try cutting the top part and the skirt part separately. Would eliminate some of the bunching. Don’t cut fabric after midnight. Next Next post: Cats in Space Pouches For Sale!